Posted on January 19, 2015 by courtneyplatt in Uncategorized. Preschoolers are curious about the world and how it works. They are budding scientists and engineers. The children at The Ridge Preschool, and preschool classrooms around the globe, love to invent, design and solve problems. They especially love to actively move materials and make something new and interesting happen. The ramp building process has been quite amazing to watch this year. The students in our class use a variety of materials in the building area for their ramp building. Some things that get used are blocks, tubes, plumbing pipes and cardboard. Some good old tape is also important to have around when using these materials that do not naturally connect together. I waited until someone thought of using the tape as a connector before it was introduced to the area. I wanted to allow time for the children to come up with the ideas without me trying to teach them how to do it. A lot of time and thought goes into each decision of the ramps that are engineered. During this process I observed the children learn about trial and error, cause and effect, design, cooperation and decision making, not to mention all of the mathematical and scientific concepts involved. 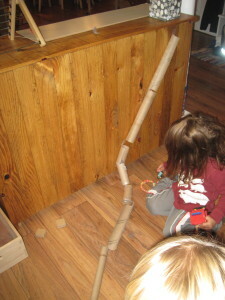 Some children enjoy making ramps that are the longest even if they don’t carry a marble or car all they way through. Others design complex curved ramp systems for their objects and some just enjoy placing a ball through one tube over and over again. This is one of the benefits of the multi-age classroom. 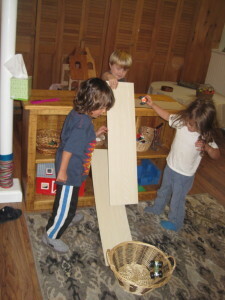 The children interact with each other and observe and question their peers throughout the entire engineering process. Over Winter Break I thought about how the classroom was working for our kids and if there was anything I wanted to change. After thinking a lot about it and going through all of my notes and observations from the first four months of school I decided that more space was needed for ramp building and engineering. A lot of space has always been used for dramatic play, block building and art but this kind of ramp design needs a lot of space for trial and error and testing out new theories. The decision was made and a new peg board corner was built for my budding engineers. The peg board has wooden dowels and metal pieces that can be placed in to form any angle desired. There are pieces of wood, cardboard, rubber and plastic gutters in the area for the children to explore with. Once it was all set up I couldn’t wait for the children to come back to school and see the changes that were made! On our first day back after the new year our new design area was a very busy corner of the room. It was used for ramps at first. Some of the older children helped pull the dowels in and out to vary the height and angle of the ramps. The younger ones would call out, “Look, it goes faster now!” or “Why is the car going slower when you change the ramp?” It was important for me to sit back and listen to them ask and answer each other’s questions as they explored. I was amazed at the foundations of mathematical and scientific concepts that this group already has. “When the ramp is up higher, the car can go down the hill fast.” “The ramp is too straight now for the cars. They aren’t moving.” Children are the best teachers of all! By the end of the week, the peg wall was used for cars, balls, marbles and even beads. Some of the younger children placed large beads on each dowel in order to decorate the boards. I never would have thought of doing that but of course, a three year old would! I can’t wait to see how else these boards get used and what else we can all learn from them together.